Happy weekend! I’ve got something to tell you guys, and it’s important. They are maybe the best thing to ever happen to cookies, and I totally mean that. If you’re like me, usually 2 batches in, you’re like totally over baking cookies and wishing you hadn’t made a double batch. How many times do I have to scoop and roll before this is over? I mean don’t get me wrong, I love baking, obvs. But I love to bake things that are fairly easy, and completely satisfying as a whole experience. Rotating pans in and out of the oven for 3 hours just lessens the ease. There’s certainly no end in sight for traditional cookies. 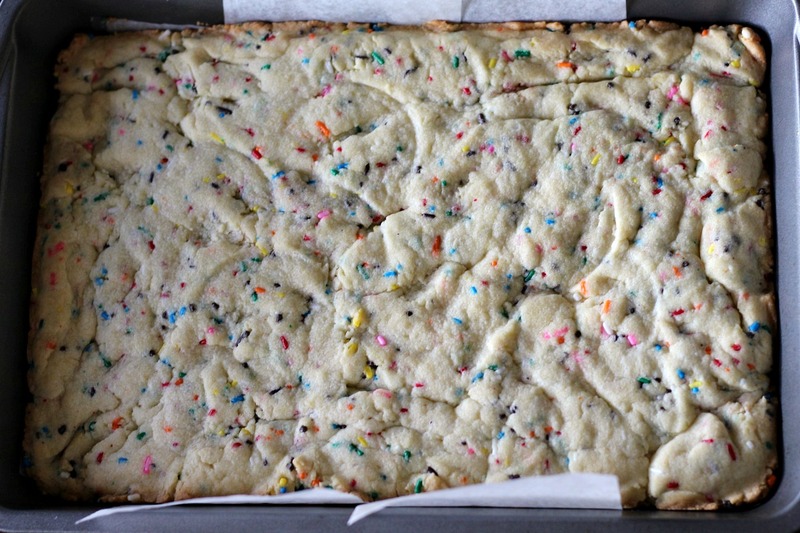 But finding epic cookie recipes that you can just spread out into a cake or sheet pan- that’s golden. One bake you guys, one single time. It’s perfect. You cut the sheet of cookie into, well, cookie-sized bars, and you’ve just made possibly two dozen cookies at one time! My favorite cookies are classic sugar, and if you add frosting you’re a hero. Today, I’m a hero. 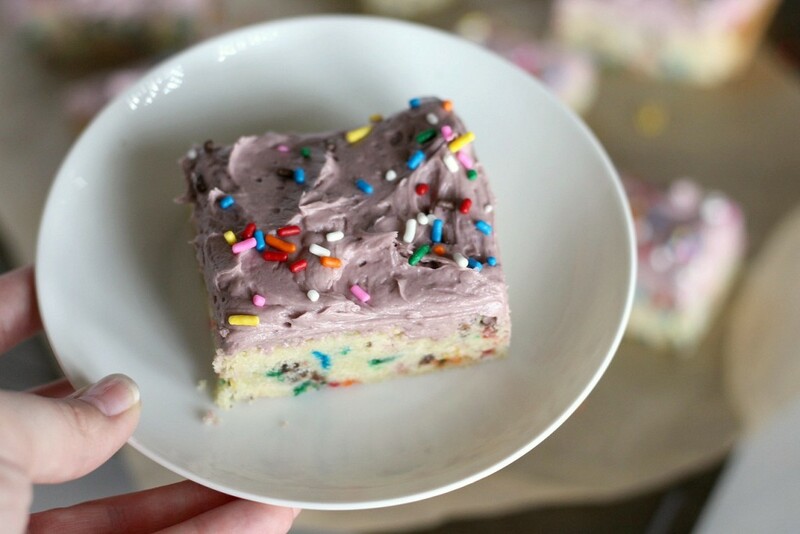 I added sprinkles because why not, and made the frosting purple for ya know, being pretty. These are tender, sweet, and super easy to whip up! 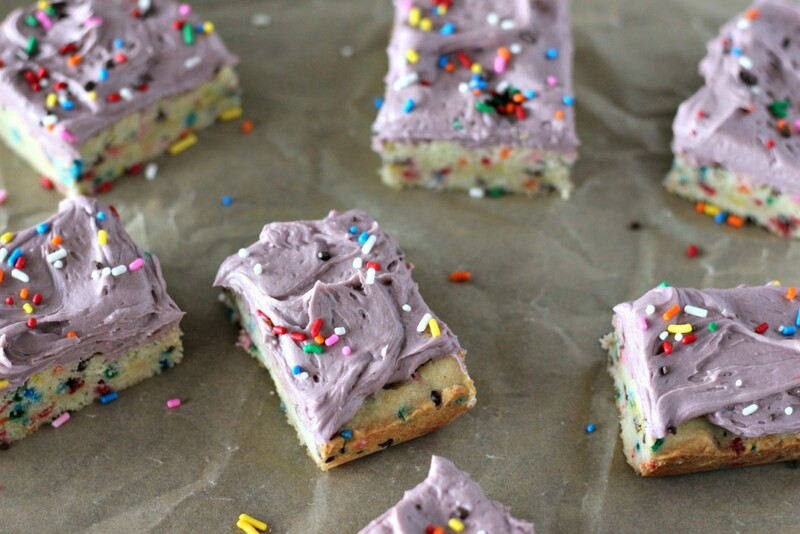 If you love sugar cookies, it’s everything you’ve ever wanted. After just a few minutes of prep and bake, you’ll be able to enjoy not only a fantastic cookie, but a super fluffy, light, and sweet buttercream. Preheat the oven to 350 degrees, and grease and line a 13 by 9 inch cake pan with parchment paper. Beat together the butter, oil, sugar, and powdered sugar until combined. Add in the egg, water, vanilla, and almond extracts. Beat until just combined. 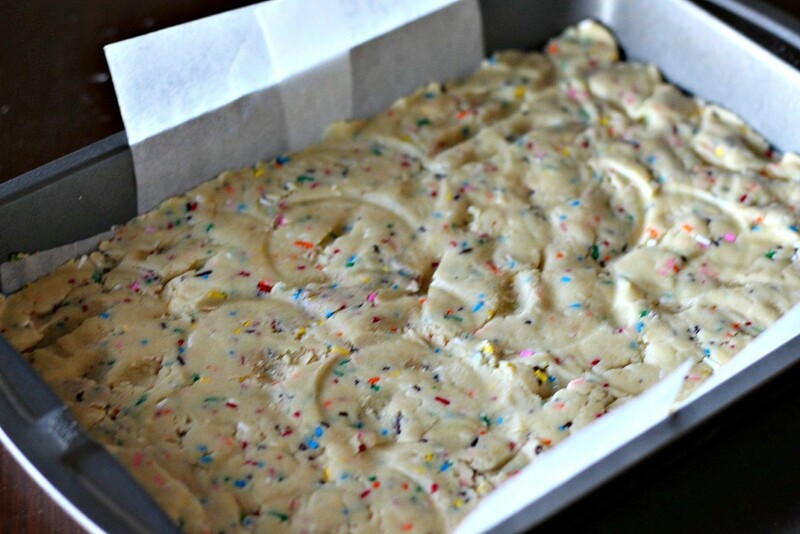 Spread the dough into your lined baking pan and press down evenly. Bake at 350 degrees for 14-16 minutes, or until just golden and set. Let cool completely before frosting! Beat together the butter and powdered sugar until smooth. Add in the vanilla and almond, and the heavy cream. 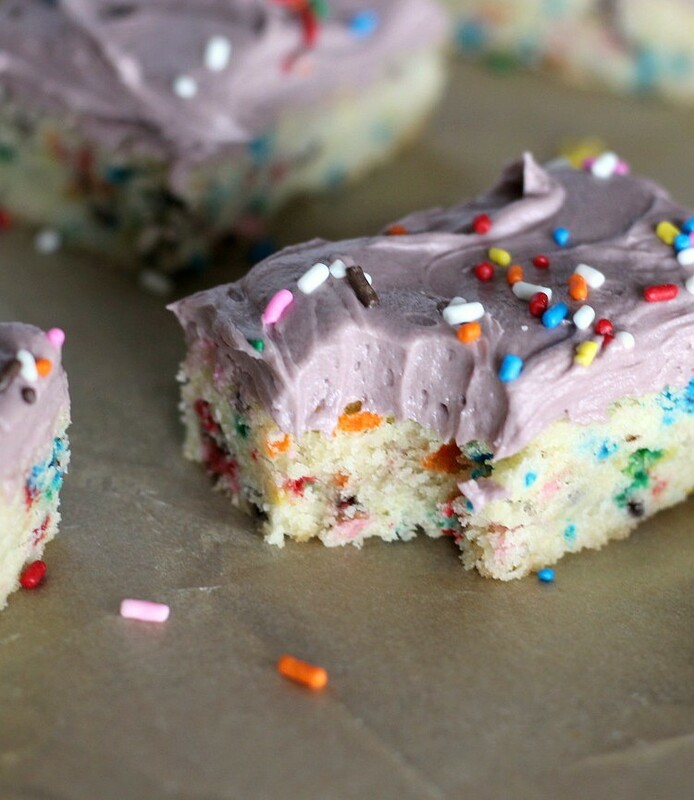 Beat until the frosting is fluffy. 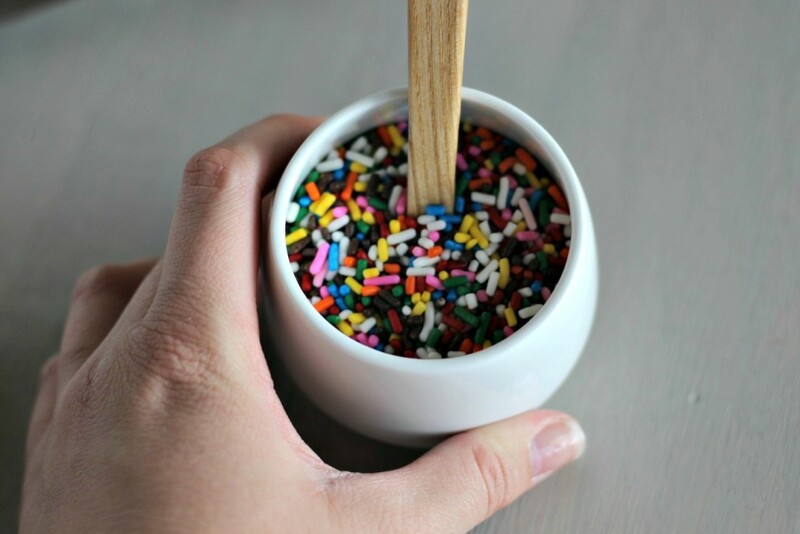 Add in your food coloring, and spread over your cookies! 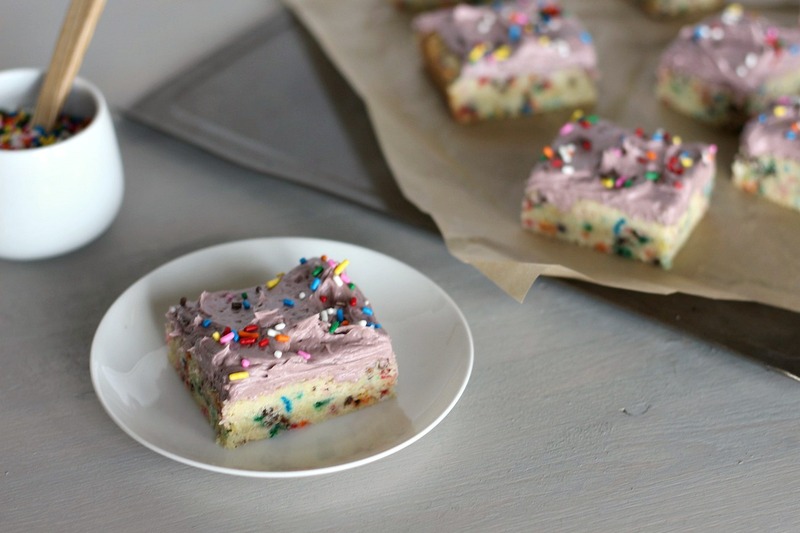 Cut the cookie sheet into bars, and enjoy!